I’m old enough to remember the Green Goddess salad dressing craze from the 70s and 80s. Anybody else remember it? Made popular in the 70s by Seven Seas (now part of Kraft Foods), this herb-tinted dressing got its start at the Palace Hotel in San Francisco. Executive chef Philip Roemer created the dressing as a tribute to actor, George Arliss and his hit play, The Green Goddess. It’s a shame that ranch dressing came along in the 80s and knocked Green Goddess into oblivion. Don’t get me wrong, I have enjoyed ranch dressing in my day, but there should have been room for both to share the spotlight. Here’s hoping for a rebirth of this delightful dressing. I feel certain that the bottled version of this dressing from the 70s was chock-full of artificial flavors and colors. This creamy homemade version, however, brims with fresh all-natural herb flavor. You can use whatever herbs you prefer in this recipe. I used parsley, tarragon, and scallions for this version, but basil, cilantro, and dill work very well as alternatives. 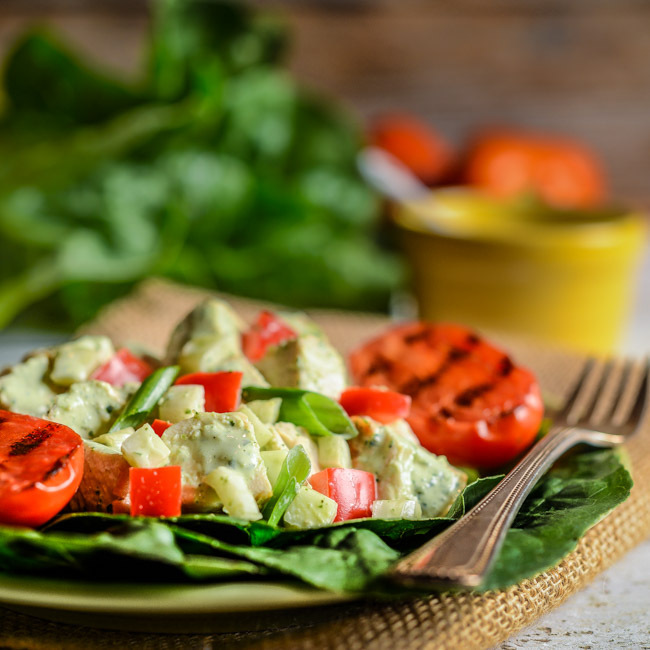 This chicken salad recipe couldn’t be easier and quicker to prepare. All the dressing ingredients get mixed in a food processor or blender and tossed with cubed chicken breast, chopped red pepper, fennel bulb, and scallions. Serve on romaine lettuce with grilled Roma tomatoes and you’ve got a super delicious and healthy lunch. 1. Place all ingredients in a food processor or blender and process until smooth. 1. Heat grill pan over high heat. Cut tomatoes in half, lengthwise. Brush with olive oil and place cut side down on grill pan. Grill for 2 to 3 minutes. Remove from heat. 2. In a large bowl, mix chicken fennel, red pepper, and scallions. Toss with dressing to taste and mix well. Add additional salt and pepper as needed. 3. Place lettuce leaves on salad plates and top with chicken salad. Garnish with grilled tomatoes and serve immediately. These were excellent, I only wished I had cut the fennel and onion smaller. Love this updated version of a classic, Bill! And the history behind it. I love a good ranch dressing, but this seems much more elegant. Lovely recipe. Thank you so much, Kalyn! I really appreciate your featuring the recipe. Looking forward to exploring Kalyn’s Kitchen. Bill – these photos are seriously GORGEOUS – I don’t remember the Green Goddess dressing – but I am loving your take on it! Green Goddess is making a come back! I just had it at a Seattle restaurant and was surprised to see it on the menu. Beautiful and yummy post! I haven’t thought about green goddess dressing in years! Much less tasted it. Great stuff, and its flavors works perfectly in this recipe! Thanks. I absolutely remember Green Goddess, and I bet you are right about the additives, but it sure did capture my palate. I have to say that your “all-natural” version sounds great. And I love your retro font styling. Well done! Wonder if skipping the anchovy paste would alter the flavor greatly!? Have someone with a fish allergy! Enjoying your blog! Thanks for dropping by Southern Boy Dishes, Jen. I think you could leave out the anchovy paste. It give salty background flavor, but I think this recipe would work just fine without it. Wow, Bill, this dressing looks and sounds absolutely amazing! And the grilled tomatoes?! Fuggedaboudit! Yum! I also remember Green Goddess dressing and it was so yummy! I’m not the cook in the family but I’m going to have my husband check the website out. The other recipes look scrumptious. Especially the lamb chops. Kudos! Thank you so much for dropping by and leaving a comment, Janice!